THE ENTRANCE FEES AND THE RESERVATION FOR THE COLISEUM, THE ROMAN FORUM AND THE PALATINE HILL ARE INCLUDED! The Colosseum still remains the greatest architectural legacy from ancient Rome. Vespasian ordered the construction of the elliptical bowl called the Amphitheatrum Flavium in A.D. 72; it was inaugurated by Titus in A.D. 80 with a bloody combat, lasting many weeks, between gladiators and wild beasts. At its peak, under the cruel Domitian, the Colosseum could seat 50.000. The Palatine is where Romulus killed his brother Remus and founded Rome in 753 BC. today it's a beautiful area of ruins and great views. Overlooking the Roman Forum, the Palatine was ancient Rome's poshest neighbourhood; aristocrats sought to build houses here and successive emperors built increasingly opulent palaces. But after Rome's fall, the Palatine fell into disrepair and in the Middle Ages churches and castles were built over the ruins. The famous Spanish Steps are filled in spring with azaleas and other flowers, flower vendors, jewelry dealers, and photgraphers snapping pictures of visitors. 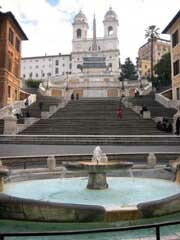 The steps and the square (Piazza di Spagna) take their name from the Spanish Embassy, which used to be headquartered here. Designed by Italian architect Francesco De Sanctis and built from 1723 to 1725, they were funded almost entirely by the French as a preface to Trinità dei Monti at the top. The Tour ends at Piazza del Popolo from where you’ll be picked up by our bus driver for the return to Civitavecchia. The Roman Forum is open daily from 8:30 to one hour before sunset (16:30 in winter, 19:15 in summer). The Forum is closed on December 25 and on the first of January. The last entrance is one hour before the close. Wash mushrooms and coriander. Halve mushrooms unless they're small. Place mushrooms and coriander in reduced wine and simmer 10 minutes. Remove coriander. Let cool and put away in the refrigerator for at least 24 hours.